Dr.Cheran Govalan is sincere, dedicated, ethical and compassionate in what he does. He is versatile in English, Tamil and Malayalam. He has performed all major open surgeries in urology like nephrectomies, ureteric reimplantation, pyeloplasty, radical cystectomy with urinary diversion, radical prostatectomy and pelvic tumour excision. 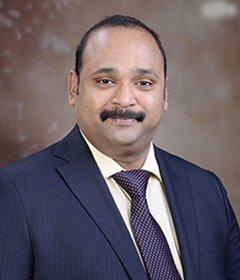 Having completed his basic medical and surgical training at the temple town of Tamilnadu, he completed his urological training from Amrita institute of medical sciences, Kochi. He underwent his Uro-oncology training and Robotic surgery training at the University of Mia, Japan. Later on he underwent his Advanced Laproscopic fellowship and Renal Transplant fellowship from Asculap Academy, under the able guidance of Dr. George P Abraham ( Pioneer in Uro-Lap and renal transplantation surgery), at VPS Lakeshore hospital, Kochi. He has been member of various urological societies [ National- USI, Regional - SZUSI, UAK, International - AUA (American Urology association) ] and has presented many research papers in various urological and surgical forums.